The markets regulator in Israel is set to propose a new regulation that would ban businesses that are based on bitcoin and other virtual currencies from trading on Tel Aviv’s stock exchange said the regulator on Monday. Chairman Shmuel Hauser of the Israel Securities Authority or ISA told a business conference he would bring up the proposal next week to the board of the ISA. If it gains approval, a public hearing would follow and then the bylaws of the stock exchange would have to be amended. Hauser said that the proposal means that if a company’s main business involves digital currencies it would not be allowed on the exchange and if it’s listed already trading would be immediately suspended. He added that the ISA must determine the appropriate regulator for these types of companies. Hauser would not identify any of the companies that his ban would affect, but two companies or more listed with the Tel Aviv Stock Exchange or TASE currently describe as essential to their business either digital currencies or technology. The two are Fantasy Network and Blockchain Mining. Blockchain stock, which Sunday changed its name, has soared over 5,000% in the last couple of months since it made the announcement it was shifting focus in the company from mining iron and gold to the mining of cryptocurrencies. It was 4.2% down in trading Monday afternoon. Blockchain could not be reached for comment. 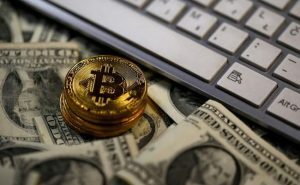 The other firm, Fantasy Networks, a former gaming company, said in December it was studying possibilities of operating in the field of blockchain, which is the technology that underpins cryptocurrencies. It price per share had quadrupled prior to losing over 50% the last two weeks. In early December, Hauser said that companies which were bitcoin-based would not be included in the indexes. In a statement on December 19 to TASE, those remarks were acknowledged by Fantasy Networks that said the restrictions could hurt investment in its company and exclude it from trading on the exchange. A value of one bitcoin plummeted 30% to less than $12,000 Friday, as investors dropped the currency following a rise to almost $20,000. It was able to recoup some of the losses on Monday to trade over $14,000 down only 9% for the day. The proposals that would block the companies working with digital currencies from trading on the stock exchange would likely be the last move Hauser makes. He is stepping down in January after being the ISA chief for over 6 years.